There’s a reason they nickname seminary “the cemetery.” Each year students actively join the ranks of academic theology with a desire to better themselves, grow in their ministry skills, and hopefully forge some lifelong friendships and ministry partnerships and many are successful in doing so. Unfortunately, several others will struggle through their two or three year program, will leave wondering exactly WHAT they believe and IF they still believe, and will render the Bible completely useless except for the fact that it can be torn apart. It is a sad reality that for many individuals seminary does not serve as a place to grow spiritually or to become closer to God, but instead pushes them further away and doesn’t help them to shift from the idealism of a young student into the maturity of a full-grown pastor. I constantly hear the alarming drop out rates amongst the pastoral profession. Many pastors do not last more than 5 years, forget about 20, and the ones that do often suffer higher levels of anxiety, stress, and depression. Many pastors begin to feel marital tensions, feel they have to compromise something (their families, their profession, their hobbies), and very few of them are schooled in the area of self-care. Perhaps most unfortunately, many pastors who do leave the church are not returning to other churches to take in ministry events or Sunday worship services, and the ones that do often sit in the back row being cynical and not too enthusiastic about stepping up and getting involved. All of these areas concern me and are the reason that I have devoted a fair number of articles on this blog to trying to help curb the problem. I believe that the two-three years someone is in seminary are crucial for shaping the type of pastor they will become and ultimately how successful they will be. Although it is impossible for any seminary to have the time or the resources to cover the breadth of all scenarios a pastor may be faced with, I would like to offer you five suggestions for what you can do in order to maximize your chances of staying in the ministry for the long run. #1: Realize that Losing Your Faith is a Very Real Reality. 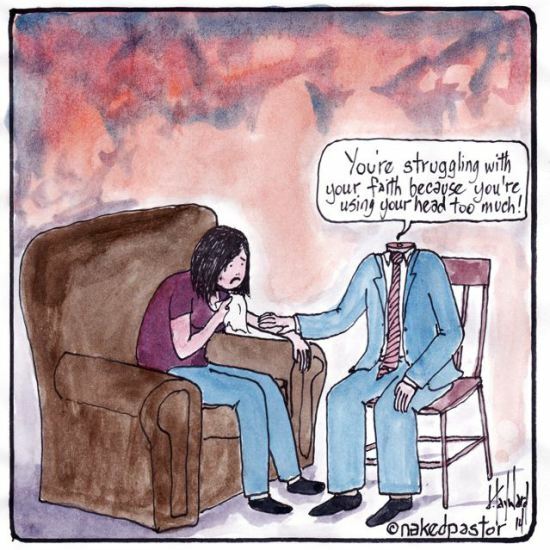 At Tyndale University College and Seminary (where I acquired 2 undergrad certifications and will be completing my master’s degree this year), our professors realize that losing your faith is a very real reality for many students. Several of these professors have had brilliantly academic students who were passionate in their studies and excelled in many areas many of whom have had tender heart to the disenfranchised completely walk away from their faith a few years after leaving Tyndale. Sadly, several of these same individuals were involved on the chapel teams, student governance, and other leadership positions while they were here. Something just didn’t properly equip them for what they were about to face when outside of the “Christian bubble.” Given that this has been a recurring pattern, Tyndale has decided that they need to do something about it rather than just passively accepting it as a “fact of life.” As a result, our professors now speak openly and freely about the dangers of becoming too academically rigid, and the need for students to seek out professional spiritual direction or counseling when they begin to feel overwhelmed. Tyndale has created a career counseling service to help student better discern their call, and tries to encourage their students to not neglect their devotional lives while training for the ministry. Tyndale realizes that all of these things may help, but that ultimately it may not help everyone. Sadly, some of my peers will eventually walk away from the ministry even after maximizing all of these services. Some of the students I went to undergrad with who I have heard share their testimonies and have worked alongside me in student leadership have already left the institutionalized church not two years after acquiring their degree to be a pastor. The important thing, however, is that we need to recognize that any one of us can become frustrated and disenfranchised by a church that we think isn’t doing as much as it should be. We can’t ignore the fact that seminary is not the place to just sit around and read children’s book on Noah’s Ark, indeed we are going to be faced with some pretty stern realities including some things we may have been sheltered from before. The best thing a school can do is to recognize this and help their students to overcome these overwhelming emotions before it is too late. #2: Realize that Bible burn-out is possible. Many times non-seminarians may judge those of us in seminary for not having more quality time with the Lord on a daily basis. What I think these individuals fail to recognize is that the whole “standard” way of doing devotions is something we bring to the text and not the other way around. As an academician, I am unable to distance myself from the Biblical text unless I am listening to it being spoken. When I read the text, my brain automatically goes into an intellectual mode. In seminary, we are constantly reading and discussing the Bible – it’s the #1 textbook we have, so when we want to spend time with God, for many of us, the Bible is not going to be the answer. Personally, there have been a few times when I have had to take an intentional break from the Bible. Right now, I am actually doing that. I don’t want the Bible to become stale and boring or been seen like a chore, so I put it away, except when I am reading for class, and then try to engage in other creative ways with God. Sometimes I may go for a walk in nature, other days I may listen to praise and worship music and sing along for an hour, and sometimes I just spend time in deep prayer. Certain Scripture verses or passages may come to mind and I don’t ignore them, but as seminary students we need to find fresh and vital ways of keeping our faith alive, not rote ones that take away our creativity. #3: Get Involved With Spiritual Life On and Off Campus. I have often heard seminary students say (and I have felt the same way myself on many occasions) that the reason they don’t attend their school’s forums or chapels is because they are just so tired of having someone “talk at them.” They sit in lectures all day and then the last thing they want to do is listen to a 30 minute sermon by one of their profs. It just feels too much like school. There are two things that I would say to this argument. Firstly, I believe there is a sense of needing to push ourselves even when we don’t feel like it. Sure, it can be a challenge to go to chapel. Even people who truly love the Lord will have days when they feel like they have other pressing matters to attend to or they may be stressed, overwhelmed, or even depressed. They may feel like they have no energy to praise God, they may even be angry with God. It is usually in those times that we need God the most. Sometimes I begrudgingly go to chapel and half-heartedly sing the worship songs, but usually it doesn’t take me too long to realize why I am there and to open myself up more for what Christ wants to teach me. Usually in those times I am very grateful I forced myself to go and looking back have found those to be some of my most profound moments of worship where Christ truly met me, walked with me, and helped to restore and rejuvenate me. Secondly, I think these students have a point. It can be cumbersome to be part of an activity that feels too much like school, especially when it’s happening on the school premises and where people from the school are speaking at it. That’s why I would recommend that while you SHOULDN’T give up on chapel completely, that you do have some kind of outlet outside of the school building. It could be something structured and spiritually focused like being part of an off-campus Bible study or small group, it could be something Christ-centered that revolves around serving others and being hands-on like volunteering once a week at a soup kitchen or sorting clothes at a homeless shelter, or it could even be something not explicitly Christian but that helps rejuvenate and refresh your soul like being part of a hiking or back-packers club. The important thing is that you make friends outside of your school community, that you have something to invest in and that gives you meaning when you’re not working on essays, and that ultimately reminds you of WHY you are in seminary. #4: Escape the Bubble From Time to Time. Virtually every seminary student I have ever met who has graduated from an explicitly Christian institution has warned me about “the bubble.” This is where one is safely guarded from the evils of the outside world, where all of their friends are from within their school, and where leaving the school to go and get supplies from the local drugstore becomes a big deal. In a sense, there’s nothing wrong with the bubble. It’s good to be part of a Christian community with people who share the same morals and values, but it can also be incredibly dangerous because sometimes when people leave these bubbles they have entirely forgotten how to interact with the outside world and with people who are quite different from themselves. This then leads to discontentment and ultimately under-achievement in the ministry. To avoid this problem, I highly recommend occasionally leaving the bubble and exposing yourself to different groups of people, including ones that are in situations that may be out of your comfort zone. Perhaps you’d like to consider volunteering with street youth or tutoring children with developmental disabilities. Perhaps you’d like to get involved with an organization that helps victims of domestic abuse or work at a local pregnancy centre or volunteer as a spiritual care companion at a hospice walking alongside patients with AIDS. Doing these types of activities, especially with an organization that isn’t explicitly Christian will help provide hands-on training and tools for you, further distil your passion, and remind you that life is not as perfect as the seminary lounge, but that there is indeed a lot of brokenness and hurt going on around us. Another way to avoid the bubble is to do some training and learning in an area that you won’t touch in seminary and that perhaps will bring no theological value to you, but that you’ve always been interested in. Think about taking a cooking or cake decorating course, learning more about photography, or learning a language other than Greek or Hebrew. In my first year of seminary, I focused on improving my French. I met once a week with a native French speaker and together we conversed solely in French for an hour and a half. My French improved exceptionally and soon I was able to have fuller conversations with other French speakers. It gave me a break to be away from campus (especially because I didn’t have a car) and I also felt like I was engaging another part of my brain while being productive. This year, I am choosing to invest into learning more about nutrition. It’s an area that I could certainly improve on, so I am making an effort to get off campus and meet with a nutritionist so that I can have accountability and learn new skills. Wherever your interests lie, try to pursue them. You won’t be disappointed. #5: When It’s Your Break, It’s Your Break. Inevitably over semester breaks, I will try to cram even more learning in and become discouraged that I didn’t accomplish more than I set out to. This is an unhealthy recipe that leads to disaster (or at the very least, burn-out). Rather than trying to constantly be learning new things, know that it’s okay to take a break. Read up on books that have nothing to do with theology. Read fiction, poetry, biographies, or whatever, but don’t you DARE think about reading Thomas Aquinas or C.S. Lewis over your break (unless, of course, it’s Narnia ;)). Don’t berate yourself for watching a movie. Get up, stretch your legs, and walk around. Call up your non-seminary related friends and go visit them and talk about something, anything, other than Calvinism and Arminianism. Remind yourself that you have a life outside of the academy and the church. As long as you keep doing that, you should be able to survive the ministry for years to come. Other than having a very sure sense of calling and career direction, perhaps the single best way to ensure success in the upcoming years as you pastor a church is to practice self-care. Unfortunately, many schools do not offer as much instruction in this one area as they should, so the onus largely lies on the student to figure it out for themselves. These five tips are only suggestions, but I hope that at least one or two of them will work for you. What are you suggestions? How have you handled getting through seminary with your faith in tact? I’d love to hear from you. Drop us a line in the comments with what you think works best.